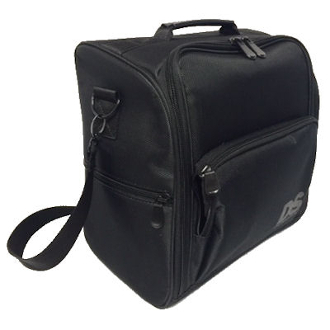 DuraSilk™ Artist series professional case. Designed specifically for the hairdresser, colorist, and artist, this case makes a quality statement while organizing your tools. Stylish case has adjustable shoulder strap, zip down front allows full access and viewing of your gear inside. Includes two stackable clear pods that hold and organize your gear. Inside top of the case has extra space for your dryer or other necessary gear. Zip around pods have clear top so you can see the items inside. Make it a color case by filling with your color tools, bowls, foils and such… or make it a styling /cutting case by filling with your combs, brushes, clips and such. Modular design lets you add or leave out cases to fit your gear. Promote your professional image by keeping your tools and gear organized. Front flap displays and organizes your combs, clips and such. Zippered Side pockets. Matte black hardware. Back slot on bag allows you to stack over your rolling suit case for ease of travel. Tools not included.